Book your introductory flight with Airborne Flight Training today. Book a introductory flight or purchase a gift voucher and you will experience a taste of the freedom of flight in our Magni Gyrocopters. 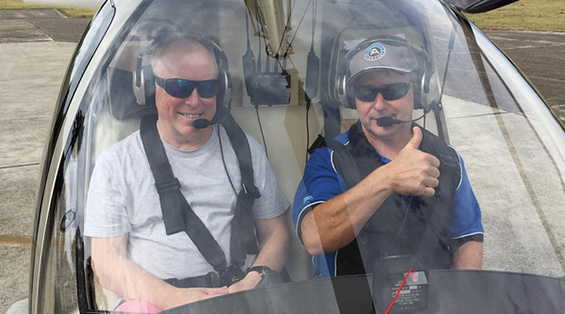 Enjoy the spectacular aerial views around Lake Macquarie and Newcastle beaches in an Airborne Microlight. Flights can be booked via email fly@airborne.com.au, phone 0439 922 133 or 02 4944 9199 or fill out the booking form below. You can also pre-purchase a gift voucher for that special occasion. Flights operate daily weather permitting. We offer training for full licenced courses and the endorsements you will need to operate a gyrocopter at most airfields around Australia. Our gyrocopters are capable of flying long distances (up to 438 nautical miles or 800 kms on a tank of fuel). They can operate in most area that are allowed by general aviation aircraft. Courses can be taken over a period or as a block over a few weeks. See our lessons structure page. Find out more and contact, email fly@airborne.com.au, phone 0439 922 133 or 02 4944 9199 or fill out the booking form below.